Following an acclaimed career in hard-hitting TV drama, director Alan Clarke achieved a cinema hit with this much-loved comedy. Following an acclaimed career in hard-hitting TV drama, director Alan Clarke achieved a cinema hit with this much-loved comedy. 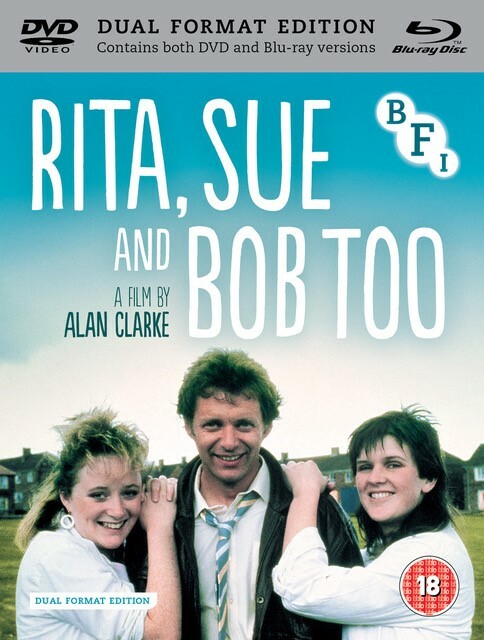 Following an acclaimed career in TV drama (much of which was made available in last year’s BFI box set release, Dissent and Disruption: Alan Clarke at the BBC 1969-1989), director Alan Clarke achieved a box-office hit with the much loved raunchy comedy Rita, Sue and Bob Too. Adapted by Andrea Dunbar from her own play, based on her upbringing on Bradford’s Buttershaw estate, Rita, Sue and Bob Too contrasts bawdy laughs with astute social commentary. 30 years on and newly restored by the BFI, the film is released on Blu-ray for the first time in a Dual Format Edition. Extras include a newly filmed documentary, Having a Ball: The making of Rita, Sue and Bob Too, with extensive cast and crew interviews. Bradford teenagers Rita (Siobhan Finneran) and Sue (Michelle Holmes) regularly babysit for Bob (George Costigan) and Michelle (Lesley Sharp), whose comfortable suburban lifestyle contrasts with the girls’ bleak life on a council estate. One evening when Bob is taking them home, he smooth-talks the girls into a three-way sexual relationship. At first it is all a bit of fun, but tempers flare once the affair is out in the open.